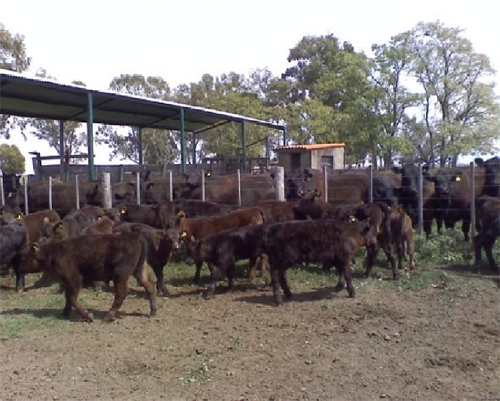 1) Wean calves for slaughter fat (ball), 220-240 kilos with price differential on the calf wintering. 2) Wean calves to heavier winter itself , shortening the winter cycle. 3) Weaning calves with further development allowing them to reach without difficulty a precocious entore at 15 months. 4) Given scarce forage or as difficult categories of first calving heifers before the second service and get higher rates of pregnancy in mothers offering better body condition as not being required in infancy and achieve better weaning weight of calves . 5) Achieve an overall increase in load without falling pregnancy and average weaning weight , making the cows enter the restriction winter with better body condition. 6) Perform early weaning, at 4-5 months of age with weaning weights similar to traditional weaning 6-7 months , allowing recovery of body condition before it decays mothers forage quality which allows a new birth in better shape and a good peak milk in it. 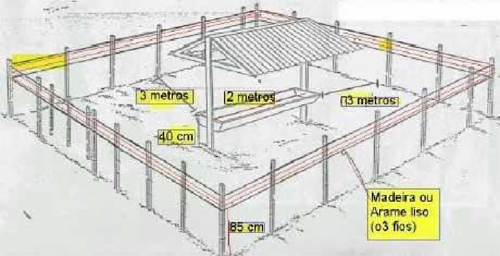 It is important that the facility be located within the paddock where the cows graze and a location near the hacienda of concentrated such as drinking or shadows. 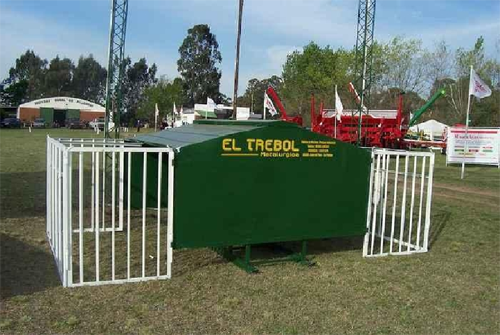 It can be placed near the corral rolls creep feeding to stimulate the concentration of property in the vicinity. Within the pen is placed hopper feeders or troughs ensuring a 30 cm length per animal linear in the case of the trays, and 5 cm in the case of hopper feeders. To ensure good results is important to get an early consumption by calves. should begin to supplement the calves to a median age of 60 days, or weighing between 70 and 120 kilos. 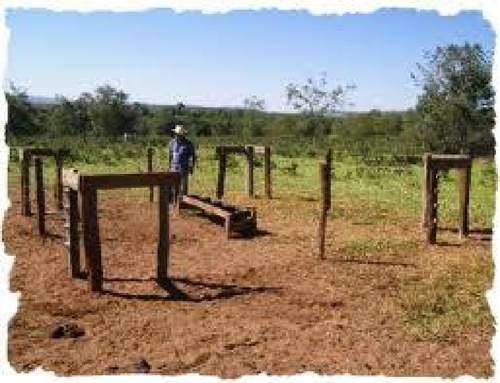 The habituation of calves or by setting off the feeders and waterers surrounding the farm for a couple of hours every day for a week for calves entering the trough of curiosity and get used to eating the food either can put together a small square of electric around the feeder with the same purpose. Other ways to accelerate the habituation is also allowing access to the corral mothers during the first days to be taught to calves, or calves incorporate the lot and used to consume balanced food lure do the rest. In some cases it may be necessary to place burden on the feeders to encourage initial use. Is a key food deliver high palatability and aroma to stimulate rapid decision-ration. At first it should put small amounts of food: no more than 100 grams per head per day during the first week, the second 200 grams and 300 grams in the third week, before allowing access at will. In the hopper feeders should not put more food than they consume in a week. After two months of age must be supplemented at the discretion or rationing between 0.75 and 1.5% of the live weight of calves with good quality balanced food. This feed contains at least 15% of high-value protein and biological TND 67% of ensuring an adequate growth rate. To promote acceptance of calf palatability improves with the addition of flavorings. The food may include any ionophore () to improve the conversion efficiency. Looking in the literature circulating the test results of creep feeding both differential calf weight as the apparent conversion, see very variable results. As the weight differential the extra kg calves that received supplementation at the foot of the mother in front of witnesses who did not receive such supplementation, and the conversionapparent the amount of kilos of supplementation needed for each one of those extra kg peso against the witnesses. Metabolically calves are very efficient real conversions achieving very low, of the order of 3 to 4 to 1 to foods with good energy . But to supplement this replaces the calf of the forage for food. If there are high levels of replacement calves gain with supplementation is not much greater than the witnesses who are eating only grass and milk, resulting in high levels of apparent conversion. Initially milk than enough to cover the requirements of the calf and maintain high levels of profit. But from the 60 – 70 days of age, begins to decline while dairy calf requirements continue to rise. 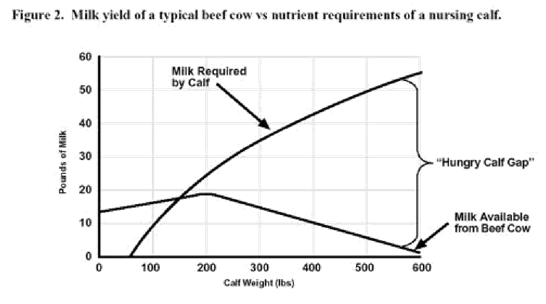 If there is insufficient foragequality available to calves, they can not develop their potential gain level. 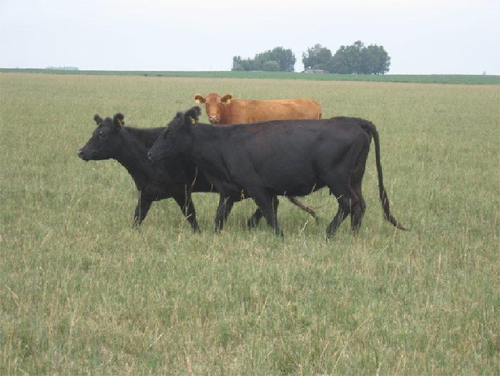 On average grazing conditions in the fields of breeding quality is not enough to get these high levels of gain, especially when there is normally a low quality forage as summer progresses. The Creep Feeding points to make up for the drop in milk production and lack of forage quality in order to maintain high levels of gain in calves. In general we can say that the creep feeding keeps gains of around 900 grams to 1 kilo a day in calves .Therefore the lower the expected gain of calves unsupplemented greater the weight and smaller differential substitution effect for concentrated forage creep feeding implement. For example when daily increases unsupplemented calves are less than 750 grams per day can be raised with creep feeding in from 150 to 200 grams obtaining a differential of 20 to 30 kg at weaning. Therefore the differential responses to creep feeding will be greater when the witness is furthest away from achieving their potential profits, that supplementation situation will have a greater effect and less replacement additive. 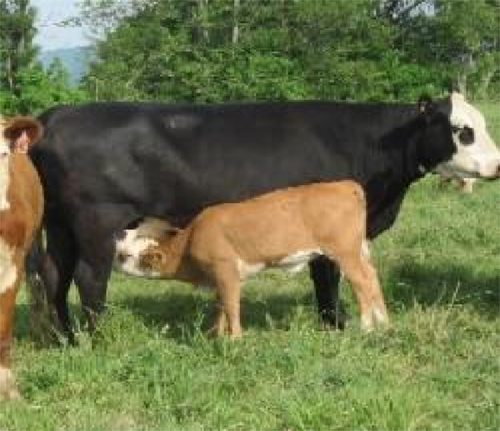 This situation occurs when forage supply is limited by low availability, low quality or high stocking, when the mother’s milk production is lower because they are heifers, fall calving, cows very old or low genetic capacity for production milk . O when calves have a high genetic potential for growth that can not reach with the contribution of milk and grass alone . 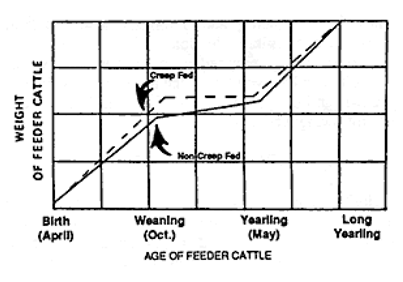 Therefore, the technique of creep feeding beef production increases the breeding herd through increased weaning weight, improved cow weight and a potential increase in load . We can calculate the extra kilos Calf-Mother-Load feasibly be obtained in a creep feeding system in about 60 kilos when calves supplemented with 140 kilos of food. Of these kilos, higher will be the differential calf ratio the poorer the field forage quality and therefore lower substitution. In conclusion , with Creep Feeding technique achieves better spreads the worse the year, but for the same price more income achieved in the best years. 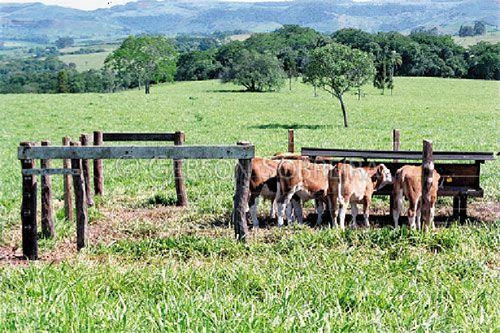 Therefore, it would be advisable to start with this technique and go regulating the level of supplementation as how to evolve forage quality, stocking, pricing and sales opportunities. Issued in furtherance of Cooperative Extension work, Virginia Polytechnic Institute and State University, Virginia State University, and the U.S. Department of Agriculture cooperating. Alan L. Grant, Dean, College of Agriculture and Life Sciences; Edwin J. Jones, Director, Virginia Cooperative Extension, Virginia Tech, Blacksburg, Jewel E.Hairston, Administrator, 1890 Extension Program, Virginia State, Petersburg.